the black lady other gave Michael ? All these people end up in the temple. The oriental guy at the temple doesn't give any clue if all the people on the list are present does he. I believe you are speaking of Mrs. Klugh? I was also wondering about this. I had a gut instinct that it was just a list, and did not say "Sayid needs to live." or "Save Sayid." Somehow, the others know of the people on the list, they know what the significance of the list is, and they know how important it is. 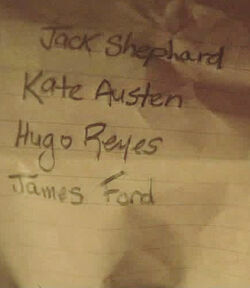 However, I thought that Jack was NOT on the original list? Or am I getting that mixed up with someone else? The list Klugh gave to Michael was apparently not the same list that Ben (presumably) got from Jacob because in one episode, Danny is all pissed off (surprise) and says, "Shephard wasn't even on Jacob's list." If I remember, that's actually the first time we even hear about Jacob.